I am planning a birthday party soon. As all preparations should be done just before the party, bread is something that I can do in advance. And freeze. And then unfreeze just the day before the party. As simple as that. Baguettes are perfect for starters as their slices are small, so this is the recipe I used for this. Poolish is nothing else than a preferment in which the quantity of water and flour are equal. With this, you get a kind of dough at 100% hydration. Kept overnight on the counter top of your kitchen will become spongy. 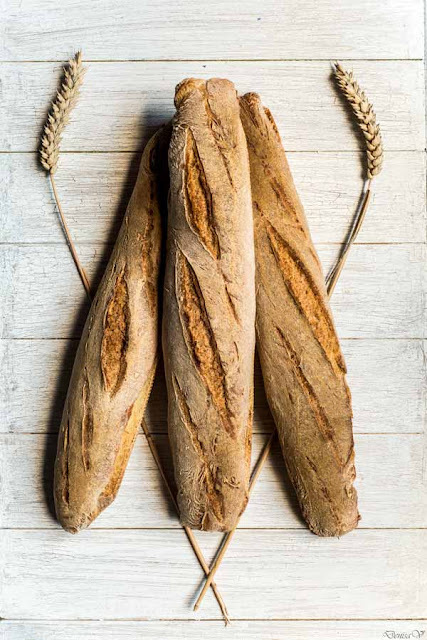 The name came from the Polish bakers who brought the method in France, back in the mid 19th century. 21:00 (the day before) Make the poolish 12-16 hours before. Let it sit at 19ºC. 11:15 AM Mix all ingredients with a standing mixer. 11:30 AM Bulk fermentation 2h. I did one stretch and fold after 1 hour, at 12:30 AM. 13:30 Divide and shape 3 long baguettes. Lay them in a baguette tray. 14:00 Final fermentation 2h at 19ºC. 15:30 Start to preheat the oven. 16:00 Bake for 15" at 260ºC with steam and then another 30" at 220ºC. This recipe was inspired from Bread: A Baker's Book of Techniques and Recipes - Jeffrey Hamelman, page 92-93. These baguettes look perfect. I love the nice crust that you got.